We thought the expansive Bonneville family would be complete with the introduction of the Bobber. But clearly, Triumph had other ideas. Despite having the most successful motorcycle on its hands in its 115-year history, Triumph has added another model to its Bonneville lineup, the Speedmaster. The Bobber and the Speedmaster follow the same basic philosophy but differ in one critical area. Where the Bobber is for the solitary rider, the Speedmaster is geared for taking a pillion along. Of course, the Speedmaster has a different suspension geometry and handling characteristics. That’s why we’ve come to sunny California to find out. The Speedmaster is essentially the Bobber but re-engineered for two-up riding. A lot of manufacturers fall short when it comes to blending retro styling with modern technology. 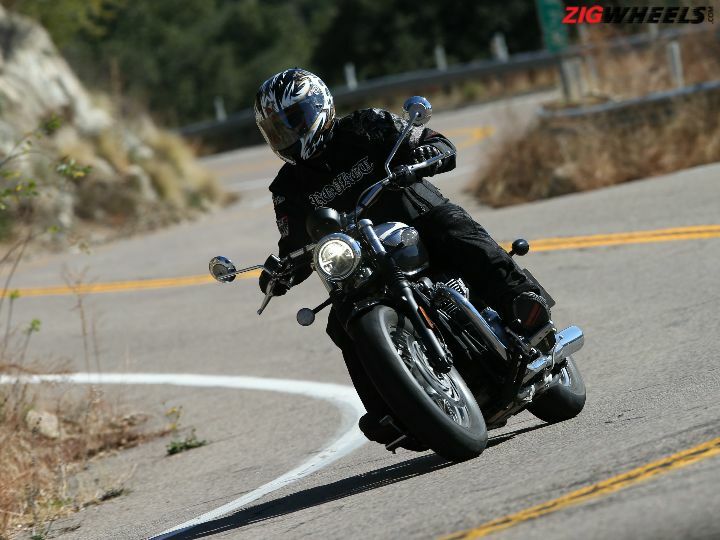 But Triumph seems to have perfected the formula and has been honing it with every new addition to the Bonneville family. The lighting system on the Speedmaster is all LED. And the DRLs up front let you know from the very first greeting that this is in fact a motorcycle of the 21st century. But the rest of the modern touches are cleverly disguised under either the retro masking or body work. The teardrop-shaped tank looks well proportioned - the bike we had was the white and phantom black separated by a hand-painted gold pinstripe. The faux carburettors hide the throttle bodies and the traditional engine fins make it seem air-cooled at first glance until you notice that massive radiator up front. The whole bike sits on spoked wheels with a 130-section tyre up front and a 150-section tyre at the rear. In essence, the Speedmaster is a more practical bobber with more focus on long-distance riding. It looks like a true British custom motorcycle that echoes the vibe of the past era. The beach handlebars are wide and angled towards you, while the seat height, at just 750mm, is quite low. The front-set pegs aren’t too much of a stretch either, which on the whole should enable the average Indian rider to tame the Speedmaster in a relaxed manner. The seats are well padded and feel plush to perch on. Overall, the ergonomics give you a sense of sitting into the bike rather than on it. Also, considering its bulk, it feels rather compact but never cramped. The engine is the same 1200cc 8-valve SOHC parallel twin that also powers the Bonneville T120, Thruxton, and of course, the Bobber. It makes 77PS of max power and 106Nm of peak torque. According to Triumph, the Speedmaster makes 10 per cent more power and torque at 4500rpm than even the T120. On the move, the engine feels refined and as smooth as the term ‘smooth’ itself. There is ample torque from the word go. So you don’t really have to wait for the revs to build up and catapult you into the horizon. The twin exhausts emit that quintessential British rumble at low revs that turns into a throaty thump as the revs climb. What really amplified the overall ride experience is the sound of the crackling overrun every time you close the throttle. The ride-by-wire throttle feels responsive. The engine is mated to a 6-speed gearbox that shifts up or down smoothly at the slightest of prods from your left foot. Plus, it comes with cruise control as standard. Just rev to achieve the speed you desire, press the cruise control button and the bike sticks to the speed until you twitch the throttle or pull the brake/clutch lever. Our planned route took us through almost every riding scenario a cruiser could go through. The city or village (if you could call it that) of Carlsbad, the open freeway (highway) and the twisties through the mountain roads. So let’s start with the city. The Speedmaster sports 41mm KYB cartridge-type forks up front and a KYB monoshock with adjustable preload at the rear, all because it is built to be comfortable even with a pillion and panniers on. The 90mm and 73.3mm of suspension travel on the front and rear respectively, translates to superb bump absorption. Sometimes you do expect to be unsettled, especially over rumble strips, but it rarely happens. Therefore, the suspension should be able to handle Indian conditions quite well. On the freeway, the bike feels planted and sure-footed. Even at speeds in excess of 140kmph, the only thing that unsettles you is the wind blast; the Speedmaster remains unfazed. But the Speedmaster’s true handling capabilities come to the fore only after you turn off the highway and head onto the mountain roads, which in California are aplenty. The route we were on was a mix of smooth and uneven tarmac but we rarely felt the difference, such is the tuning of the suspension. The steering, though heavy, is quite manoeuvrable and tipping it from corner to corner does take some effort but doesn’t feel unnatural, especially given the bulk of the motorcycle. There is however one small niggle, especially since it is a cruiser motorcycle. The footpegs are foreset and sit quite low on the chassis. So, every time you push the Speedmaster into tight corners, especially switchbacks, and attempt to throttle out, the engine responds beautifully and the chassis supports it but the pegs tend to let it down. Even at moderate lean angles you will be scraping the pegs on the tarmac, giving you something to worry about, and you’re seldom able to ride freely. But, exercise caution on the tighter ones and the Speedmaster can negotiate the rest as if on rails. The Speedmaster comes equipped with twin-piston Brembo calipers and 310mm twin rotors, whereas, the rear gets a Nissin powered 255mm single disc. ABS comes as standard. The brakes provide plenty of stopping power and feel. Even a gentle tap sends the speed tumbling in no time. Though the bike does tend to dip when you brake hard, it always stays true to its line. The Speedmaster comes with a set of Avon Cobras as standard. The 130-section front and 150-section rear rubber are shod on 16” wheels and provide ample grip in the corners, especially after they’ve been heated up. Don’t worry, you don’t need tyre warmers - a 20-minute ride through the twisties will do the trick. It also comes with switchable traction control that despite being on doesn’t intervene unless you venture a bit off the road. Triumph has over 130 accessory options available for the Speedmaster, including a Vance & Hines exhaust system that can be had in three different colours. There is also a windshield, flat handlebars and oval/teardrop shaped mirrors. When the bike comes to India in a few months, it could even be offered in two special iterations: the Highway and the Maverick. The Highway edition includes an adjustable windshield with mounting kit, side panniers and a pillion backrest, among others. The Maverick edition on the other hand takes the minimalistic look and pushes it a bit further. You get a blacked out Vance & Hines exhaust, flat handlebars and a grab rail removal kit, among others. After spending almost an entire day with the Speedmaster, we can state that it certainly ticks almost all the right boxes. The styling is quintessentially British and Triumph seems to have perfected the art of making retro modern motorcycles, which makes the bike only more appealing. It can handle the freeway with ease and can hold its own in the corners. And then there’s the 1200cc HT engine that is as refined as it is reliable. Plus, Triumph has one of the best service networks in the country when it comes to premium motorcycles, and its growth is a testament to the customer confidence the brand inspires. The bike is due to be launched around April this year and since it will be a CKD, should enable Triumph to price it aggressively.